Convinced it had been too long since he’d shored up his artillery, McGee made a trip to Zabar’s where, he said, he was “startled by the choices.” We don’t need to go to Zabar’s to agree that there’s a startling number of options out there for anyone looking to buy new pots and pans (though I’d go in a New York-minute — if only to get my hands on belly lox and a nice schmaltzy piece of whitefish): All we have to do is walk through the aisles of our neighborhood supermarkets, cookware shops, department stores and Big Box retailers to see what’s out there. You’re looking at classic cast iron from Lodge, available just about everywhere. We got the griddle at [G.I.] Joe’s (to replace our Teflon version) and the Dutch Oven at Fred Meyer. The skillet belonged to my husband long before I shared his kitchen. 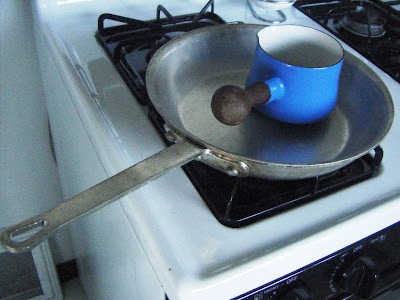 In his article today, McGee discussed what he describes as the “straightforward job” of pots and pans: “to deliver heat from the burner or oven to the food, and release the food to us neatly and cleanly when we want it.” Who among us hasn’t cursed the pancakes that stick to our griddles, the eggs that don’t go over so “easy” in our saute pan or the rice that remains glued to the bottom of a pot — even after we’ve soaked it overnight? Which might explain why I’ve got so many pots and pans. I’m always searching for the Holy Grail, and among those I’ve shared with you here, depending on the job to be done, I can always find it. Now tell me: which pots and pans do you swear by? Where did you get them, how much did you pay for them, and why do you love them? It’s got to be my All Clad. Bought my first one 15 years ago at the Bon Marche (6 Quart Dutch Oven) . . . a lady in front of me was returning it unused and since it was last year’s model, I got it for 50% of the cost. Have fell in love with All Clad ever since. They’ve got the best heat distribution, they’re very durable and they keep their looks even after years of use. I’m a Le Creuset baby. Mom had ’em, and now I have 4. Love them! Ten years ago I traded Swedish steel for French copper — that is, I sold my old Volvo and bought a bunch of Mauviel copper — and haven’t looked back. Yes, they’re heavy, but not as heavy as Le Creuset. Yes, they tarnish, but I think they look beautiful that way. And nothing cooks like steel-lined copper: perfectly even heat. I can leave this batterie to someone in my will; that old Volvo has probably gone off to the scrap heap long ago. All Clad all the way! 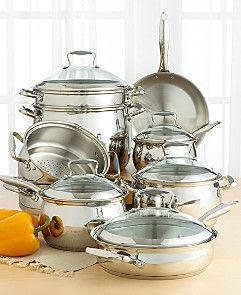 My husband bought the full set for me a few years back at the Bon Marche for a whopping $600 (but down in Portland, so no sales tax) and I use every pot and pan. I’ve supplemented with a basic non-stick from the restaurant supply store for eggs and whatnot, but I love the even heat distribution and the “cleanability” of my All Clad. I’ll never go back to anything else. 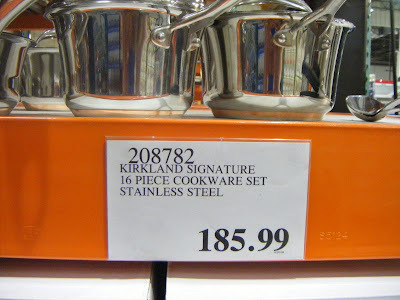 The best value ever: years ago Costco used to have heavy milled aluminum, metal-handled Wearever non-stick sautés, a 10-inch and an 8-inch bundled together for 19.95. I bought maybe four sets of them; 10-15 years later, three of the 10-inchers and two of the 8-inchers live on, still relatively non-sticky. I can still crank the heat to high under them, sear a steak off, and then throw it all under the broiler…and make a surprisingly good pan sauce from the fond! Conversely, the high-end Kirkland Signature set I purchased scorched the first time I got aggressive with them. But they’re still quite pretty. My husband and I have had Calphalon for over 20 years and we love it. I’ve had to replace a few over the years — but they have a lifelong guarantee which helps. We started with an 8″ omelette pan back in 1986 and we’ve never looked back. I’ve wanted to get a Le Creuset, but I can’t afford them! I love my 8 quart Calphalon stock pot with pasta insert. We use it a lot for everything from soups and stews to pasta sauces to corn. Only one of our pans are non-stick because we used to have a parrot and the gas that the non-stick gives off is poisonous to birds. 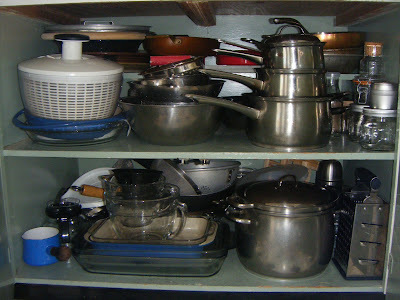 I love my Belgique pots and pans that I’ve been collecting. The best thing I have for eggs is the little cast iron pan that was my grandparent’s. It’s well-seasoned (and thus completely NON-stick without the plastic coating) and nothing makes better eggs. The things I can’t live without in my kitchen though are my Cutco knives and my Tupperware. 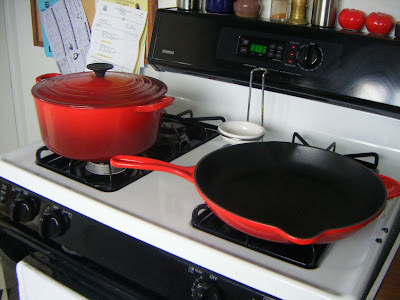 I can’t live without my Le Creuset – the 1.75, 4.5, and 6.5 ovens, the oval oven which I use for roasting chicken, the skillet, the grill pan….- and I also cherish my Calphalon non-stick, one deep, round pan for sautés and stir-fries, and one small skillet for omelets or a single grilled-cheese sandwich. 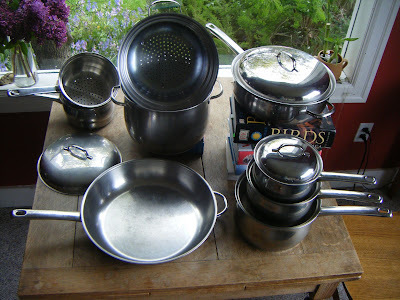 Then the usual assortment of saucepans and pots for cooking pasta or boiling the occasional egg. I use my 20 year old Le Creuset dutch ovens twice a week & my Lodge cast iron skillets (just like my Grandmas) every day. Love both & never have to worry about the chemicals in a non-stick surface. 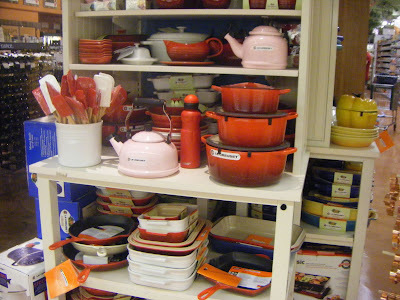 I Le Creuset’s prices leave you weak in the knees, check out the Martha Stewart brand at the Bon/Macys. We can’t tell any difference between our dutch oven and the Le Creuset my best foodie friend has. So is it easy to cook scrambled eggs in a cast iron Lodge skillet? All -Clad and Le Cruset work togeather very well in my kitchen! I have a few select pieces of each and love them all. I have purchased all except my 7qt dutch oven, which was a gift to me about 15 years ago. Now all my girls and son in law uses nothing but All-Clad and Le Cruset. The 12″ Lodge cast iron skillet in my kitchen is used for practically everything, including roast chicken in the oven! To boil water I use a humungous Revere-ware pot that someone cast-off years ago. I recently upgraded to a 14″stainless steel saute pan and 5 qt pot that has become my untility pot for everything from soups to pasta – purchased at a restaurant supply store for very reasonable prices. 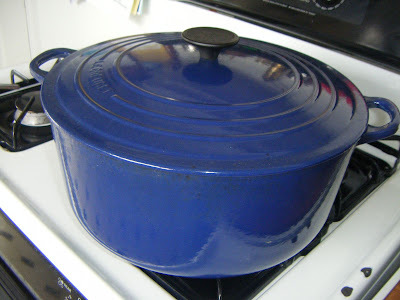 I picked up a blue enameled Lodge cast iron Dutch Oven on sale at QFC for $20 (normally $60) cause they were clearing them out. And a pair of teflon saute pans for omelets, etc, at Costco for $20. Point being, my good friends with cookware costing hundreds of dollars more prefer to eat at my house – it’s about the cook. My Le Creusets are the pans I can’t live without. Back in 1989, I got a deal from Price Club (now Costco): 5.5 Qt Dutch oven, 10 inch Saute pan, 2.5 qt pot with 8″ frying pan lid and 1.5 qt sauce pan with 6″ frying pan lid for … $100. 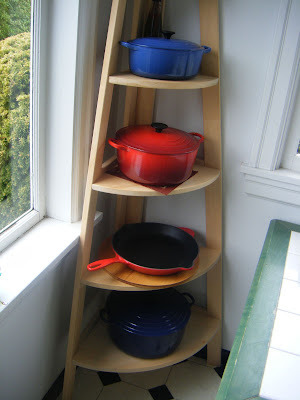 I’ve since added a 6.5 quart dutch oven and 6.5 quart oval from the Le Creuset outlet in Gilroy, CA and a couple of braisers (a 10″ and a 14″) from Goodwill ($5 for the 10″, $25 for the 14″). 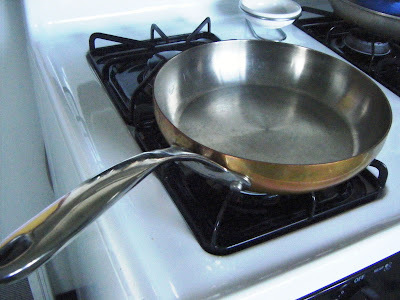 I keep a couple of nonstick skillets around–all clad or calphalon or costco’s house brand, whatever is cheapest. 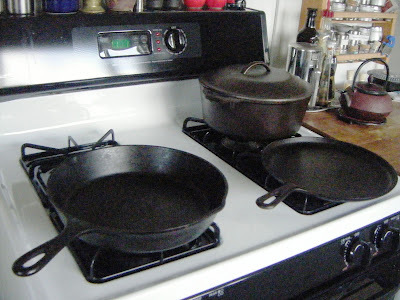 I also have a few cast iron pans–a 6″ for blintz crepes and a 10″ ‘chicken fryer’ for whatever I throw at it–stir fries up until the time I got my 14″ carbon steel wok ($7 from a store way down in SODO somewhere). We got the All Clad set for our wedding last year and absolutely love all the pieces. A special bonus was that All Clad is based in Canonsburg, PA, where my husband’s grandparents live and where his parents grew up. It was a special touch.